There comes that moment in every great man’s life when he realizes that it’s time to put up or shut up. Obama hasn’t reached that moment yet. And I personally don’t believe he ever will. Or even can. One of the central goals of this administration is restoring fiscal responsibility. Even as we have had to spend our way out of this recession in the near term, we have begun to make the hard choices necessary to get our country on a more stable fiscal footing in the long run. Despite what some have claimed, the cost of the Recovery Act is only a very small part of our current budget imbalance. In reality, the deficit had been building dramatically over the previous eight years. Folks passed tax cuts and expensive entitlement programs without paying for any of it – even as health care costs kept rising, year after year. As a result, the deficit had reached $1.3 trillion when we walked into the White House. And I’d note: these budget busting tax cuts and spending programs were approved by many of the same people who are now waxing political about fiscal responsibility while opposing our efforts to reduce deficits by getting health care costs under control. It’s a sight to see. To begin with, sixty percent of the overall deficit from the last ten years has occurred during the last three year period that the Democrats have been in control of both the House and the Senate. Any claim that Democrats were the fiscally responsible party is just frankly a complete lie. You don’t have to be an economist or financial expert to see that the Marxist red Obama bars utterly dwarf the gray Bush bars. The Obama Administration Budget released today contains a total $2.867 trillion in red ink, just 38 days after Obama’s inauguration on January 20. In contrast, the Bush Administration ran up a $2.7519 trillion deficit over an 8-year period that included 7 years of war in Iraq and Afghanistan; the economic downturn after 9-11; the addition of a prescription drug benefit to Medicare; a massive increase in federal education spending under No Child Left Behind; and the current recession and 2008 Wall Street bailout. So what we basically learn is that Obama’s deficits in just two years are greater (which means worse) than Bush’s entire 8 years in office. And if you factor in the spending that Obama racked up all by his lonesome, he accumulated greater deficits in just ONE year than did Bush in eight. 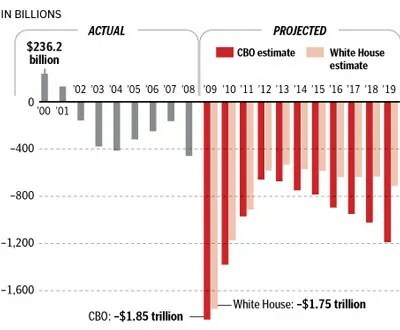 We need to realize that the $787 billion stimulus – which is not counted under Obama’s deficit that STILL outdoes the deficits racked up during Bush’s entire eight year presidency – was not a “mere” $787 billion. It was actually $3.27 TRILLION according to the Congressional Budget Office. The gargantuan stimulus bill Congress has rubber-stamped with virtually no Republican support contains tens of billions of the very spending projects that made the legislation a lightning rod for criticism. And although the bill is generally described as costing $787 billion, the Congressional Budget Office reports the actual figure is now closer to $3.27 trillion. That stems from the $744 billion it will take to pay for the additional debt the legislation will create, and $2.527 trillion in increased spending from the new and expanded programs the bill will spawn over the next decade. That put-us-into-the-poorhouse stimulus spending was ALL on Obama. And while we go from fiscal year to fiscal year (i.e. October 1 to September 30) to “officially” calculate a president’s deficits, it is simply a moral crime to saddle George Bush with Obama’s $3.27 trillion porkulus that no Republicans voted for, and then blame Bush for the most massive spending program in human history that was passed by Obama and for Obama. (CBS/AP) Acting at Barack Obama’s behest, President George W. Bush on Monday asked Congress for the final $350 billion in the financial bailout fund, effectively ceding economic reins to the president-elect in an extraordinary display of transition teamwork. Obama also sharply criticized Bush’s handling of the money and promised radical changes. Bush’s move sets the stage for Obama to get swift access to the $350 billion and the opportunity to overhaul the much-criticized rescue package after taking office next Tuesday. Bush’s classiness was outmatched by Obama’s classlessness. In any event, no matter how you slice it, we are looking at Obama red ink that so profoundly drowns out the Bush red ink that only a fool would say anything else. And yet that is precisely what Obama is doing. Here we are, just today, with Democrats passing another $1.1 trillion in spending in a 1,088 page, earmark-laden pork package, with not one single Republican supporting it. And they are determined to pass a health care that’s going to cost this country at least $2.5 trillion every ten years. We’re seeing more spending and more deficits and more debt under Barack Obama than any human being who has ever lived has ever seen in human history. And he blames Bush for it? Any real leader worth a dog turd in the back yard doesn’t waste time blaming the leader before him for problems. Rather, he puts that “the buck stops here” sign on his desk, he takes responsibility for the situation he is facing, and he solves the problem. If I had a nickle for every time Obama has said that he “inherited” the crises he is now facing, I would be very rich indeed. As it is, the president who promised that he would put “an end to the petty grievances and false promises, the recriminations and worn-out dogmas that for far too long have strangled our politics” has defined himself by doing the precise opposite. George W. Bush, by contrast, inherited a severe recession following the dot com bubble collapse beginning in December 1999 just as Clinton was leaving office that led to $10 trillion in equity being erased. And of course he inherited the foreign policy and domestic security failures that led to the 9/11 attack – which damaged the economy even further. But you didn’t find Bush giving speech after speech (or any speeches at all) blaming his predecessor. Rather, Bush “manned-up” and took responsibility for the nation as it was. Perhaps the greatest measure of Obama’s declining support is that just 50% of voters now say they prefer having him as President to George W. Bush, with 44% saying they’d rather have his predecessor. Given the horrendous approval ratings Bush showed during his final term that’s somewhat of a surprise and an indication that voters are increasingly placing the blame on Obama for the country’s difficulties instead of giving him space because of the tough situation he inherited. The closeness in the Obama/Bush numbers also has implications for the 2010 elections. Using the Bush card may not be particularly effective for Democrats anymore, which is good news generally for Republicans and especially ones like Rob Portman who are running for office and have close ties to the former President. More and more Americans are getting furious that Obama is spending all his time and energy blaming Bush for what is going on during Obama’s presidency. The very real question is whether Obama can do anything OTHER than blame Bush. Thus far, he hasn’t solved much of anything. THE PRESIDENT: Good evening. This is an extraordinary period for America’s economy. Over the past few weeks, many Americans have felt anxiety about their finances and their future. I understand their worry and their frustration. We’ve seen triple-digit swings in the stock market. Major financial institutions have teetered on the edge of collapse, and some have failed. As uncertainty has grown, many banks have restricted lending. Credit markets have frozen. And families and businesses have found it harder to borrow money. We’re in the midst of a serious financial crisis, and the federal government is responding with decisive action. We’ve boosted confidence in money market mutual funds, and acted to prevent major investors from intentionally driving down stocks for their own personal gain. Most importantly, my administration is working with Congress to address the root cause behind much of the instability in our markets. Financial assets related to home mortgages have lost value during the housing decline. And the banks holding these assets have restricted credit. As a result, our entire economy is in danger. So I’ve proposed that the federal government reduce the risk posed by these troubled assets, and supply urgently-needed money so banks and other financial institutions can avoid collapse and resume lending. This rescue effort is not aimed at preserving any individual company or industry — it is aimed at preserving America’s overall economy. It will help American consumers and businesses get credit to meet their daily needs and create jobs. And it will help send a signal to markets around the world that America’s financial system is back on track. I know many Americans have questions tonight: How did we reach this point in our economy? How will the solution I’ve proposed work? And what does this mean for your financial future? These are good questions, and they deserve clear answers. First, how did our economy reach this point? Well, most economists agree that the problems we are witnessing today developed over a long period of time. For more than a decade, a massive amount of money flowed into the United States from investors abroad, because our country is an attractive and secure place to do business. This large influx of money to U.S. banks and financial institutions — along with low interest rates — made it easier for Americans to get credit. These developments allowed more families to borrow money for cars and homes and college tuition — some for the first time. They allowed more entrepreneurs to get loans to start new businesses and create jobs. Unfortunately, there were also some serious negative consequences, particularly in the housing market. Easy credit — combined with the faulty assumption that home values would continue to rise — led to excesses and bad decisions. Many mortgage lenders approved loans for borrowers without carefully examining their ability to pay. Many borrowers took out loans larger than they could afford, assuming that they could sell or refinance their homes at a higher price later on. Optimism about housing values also led to a boom in home construction. Eventually the number of new houses exceeded the number of people willing to buy them. And with supply exceeding demand, housing prices fell. And this created a problem: Borrowers with adjustable rate mortgages who had been planning to sell or refinance their homes at a higher price were stuck with homes worth less than expected — along with mortgage payments they could not afford. As a result, many mortgage holders began to default. These widespread defaults had effects far beyond the housing market. See, in today’s mortgage industry, home loans are often packaged together, and converted into financial products called “mortgage-backed securities.” These securities were sold to investors around the world. Many investors assumed these securities were trustworthy, and asked few questions about their actual value. Two of the leading purchasers of mortgage-backed securities were Fannie Mae and Freddie Mac. Because these companies were chartered by Congress, many believed they were guaranteed by the federal government. This allowed them to borrow enormous sums of money, fuel the market for questionable investments, and put our financial system at risk. The decline in the housing market set off a domino effect across our economy. When home values declined, borrowers defaulted on their mortgages, and investors holding mortgage-backed securities began to incur serious losses. Before long, these securities became so unreliable that they were not being bought or sold. Investment banks such as Bear Stearns and Lehman Brothers found themselves saddled with large amounts of assets they could not sell. They ran out of the money needed to meet their immediate obligations. And they faced imminent collapse. Other banks found themselves in severe financial trouble. These banks began holding on to their money, and lending dried up, and the gears of the American financial system began grinding to a halt. With the situation becoming more precarious by the day, I faced a choice: To step in with dramatic government action, or to stand back and allow the irresponsible actions of some to undermine the financial security of all. I’m a strong believer in free enterprise. So my natural instinct is to oppose government intervention. I believe companies that make bad decisions should be allowed to go out of business. Under normal circumstances, I would have followed this course. But these are not normal circumstances. The market is not functioning properly. There’s been a widespread loss of confidence. And major sectors of America’s financial system are at risk of shutting down. More banks could fail, including some in your community. The stock market would drop even more, which would reduce the value of your retirement account. The value of your home could plummet. Foreclosures would rise dramatically. And if you own a business or a farm, you would find it harder and more expensive to get credit. More businesses would close their doors, and millions of Americans could lose their jobs. Even if you have good credit history, it would be more difficult for you to get the loans you need to buy a car or send your children to college. And ultimately, our country could experience a long and painful recession. Fellow citizens: We must not let this happen. I appreciate the work of leaders from both parties in both houses of Congress to address this problem — and to make improvements to the proposal my administration sent to them. There is a spirit of cooperation between Democrats and Republicans, and between Congress and this administration. In that spirit, I’ve invited Senators McCain and Obama to join congressional leaders of both parties at the White House tomorrow to help speed our discussions toward a bipartisan bill. I know that an economic rescue package will present a tough vote for many members of Congress. It is difficult to pass a bill that commits so much of the taxpayers’ hard-earned money. I also understand the frustration of responsible Americans who pay their mortgages on time, file their tax returns every April 15th, and are reluctant to pay the cost of excesses on Wall Street. But given the situation we are facing, not passing a bill now would cost these Americans much more later. Many Americans are asking: How would a rescue plan work? After much discussion, there is now widespread agreement on the principles such a plan would include. It would remove the risk posed by the troubled assets — including mortgage-backed securities — now clogging the financial system. This would free banks to resume the flow of credit to American families and businesses. Any rescue plan should also be designed to ensure that taxpayers are protected. It should welcome the participation of financial institutions large and small. It should make certain that failed executives do not receive a windfall from your tax dollars. It should establish a bipartisan board to oversee the plan’s implementation. And it should be enacted as soon as possible. In close consultation with Treasury Secretary Hank Paulson, Federal Reserve Chairman Ben Bernanke, and SEC Chairman Chris Cox, I announced a plan on Friday. First, the plan is big enough to solve a serious problem. Under our proposal, the federal government would put up to $700 billion taxpayer dollars on the line to purchase troubled assets that are clogging the financial system. In the short term, this will free up banks to resume the flow of credit to American families and businesses. And this will help our economy grow. Second, as markets have lost confidence in mortgage-backed securities, their prices have dropped sharply. Yet the value of many of these assets will likely be higher than their current price, because the vast majority of Americans will ultimately pay off their mortgages. The government is the one institution with the patience and resources to buy these assets at their current low prices and hold them until markets return to normal. And when that happens, money will flow back to the Treasury as these assets are sold. And we expect that much, if not all, of the tax dollars we invest will be paid back. A final question is: What does this mean for your economic future? The primary steps — purpose of the steps I have outlined tonight is to safeguard the financial security of American workers and families and small businesses. The federal government also continues to enforce laws and regulations protecting your money. The Treasury Department recently offered government insurance for money market mutual funds. And through the FDIC, every savings account, checking account, and certificate of deposit is insured by the federal government for up to $100,000. The FDIC has been in existence for 75 years, and no one has ever lost a penny on an insured deposit — and this will not change. Once this crisis is resolved, there will be time to update our financial regulatory structures. Our 21st century global economy remains regulated largely by outdated 20th century laws. Recently, we’ve seen how one company can grow so large that its failure jeopardizes the entire financial system. Earlier this year, Secretary Paulson proposed a blueprint that would modernize our financial regulations. For example, the Federal Reserve would be authorized to take a closer look at the operations of companies across the financial spectrum and ensure that their practices do not threaten overall financial stability. There are other good ideas, and members of Congress should consider them. As they do, they must ensure that efforts to regulate Wall Street do not end up hampering our economy’s ability to grow. In the long run, Americans have good reason to be confident in our economic strength. Despite corrections in the marketplace and instances of abuse, democratic capitalism is the best system ever devised. It has unleashed the talents and the productivity, and entrepreneurial spirit of our citizens. It has made this country the best place in the world to invest and do business. And it gives our economy the flexibility and resilience to absorb shocks, adjust, and bounce back. Our economy is facing a moment of great challenge. But we’ve overcome tough challenges before — and we will overcome this one. I know that Americans sometimes get discouraged by the tone in Washington, and the seemingly endless partisan struggles. Yet history has shown that in times of real trial, elected officials rise to the occasion. And together, we will show the world once again what kind of country America is — a nation that tackles problems head on, where leaders come together to meet great tests, and where people of every background can work hard, develop their talents, and realize their dreams. Thank you for listening. May God bless you. It is ironically appropriate that Jimmy Carter will be one of the first speakers to address the Democratic National Convention. The worst President in recent American history should be present to pass on the baton of naive incompetence to his successor. The media would have us forget Jimmy Carter’s presidential record. Remember Carter’s human rights program, where he demanded the Shah of Iran step down and turn over power to the Ayatollah Khomeini? No matter that Khomeini was a madman. Carter had the U.S. Pentagon tell the Shah’s top military commanders – about 150 of them – to acquiesce to the Ayatollah and not fight him. The Shah’s military listened to Carter. All of them were murdered in one of the Ayatollah’s first acts. By allowing the Shah to fall, Carter created one of the most militant anti-American dictatorships ever. Soon the new Iranian government was ransacking our embassy and held hostage its staff for over a year. Only President Reagan’s election gave Iran the impetus to release the hostages. The man who will be addressing the Democratic National Convention personally presided over the abandonment of an Iranian government that had been America’s strongest ally in the Middle East under the Shah and actually enabled its transformation into America’s greatest enemy in the Middle East under the Ayatollah. It’s not all Carter’s and Obama’s fault. Failure, weakness, and appeasement are in their blood as Democrats. Read the INVESTOR’S BUSINESS DAILY piece titled, “97 Reasons Democrats Are Weak On Defense And Can’t Be Trusted To Govern In Wartime“, for more on that. Jimmy Carter features prominently in those 97 reasons. When Jimmy Carter speaks, don’t bother listening to any of his pseudo-humanitarian blather. Think rather of the similarities between the failure Jimmy Carter and the failure-waiting-to-happen Barack Obama. Iran is clearly determined to progress into a nuclear-armed state, and could even have the bomb within six months if it pulled out all the stops. With nuclear weapons, Iran would be impervious to attack – even if it masterminded the next 9/11 attack against us. To underestimate either their threat or their evil is the very worst kind of folly. We have seen Barack Obama issue horrible double-minded statements that reveal both frightening weakness and indecisiveness. Obama said that Jerusalem must remain the undivided capital of Israel to Jewish groups, and then said to Palestinians that the issue of Jerusalem would be subject to negotiation. Jerusalem is the hottest, most easily-ignitable flash point in the history of the world; you simply DO NOT commit such massive blunders with this piece of real estate. Obama’s indecision and pandering weakness on Jerusalem reveals exactly the sort of man who would ignorantly empower our worst enemies and then indecisively sit on his hands while they made us look like fools, as Carter did with Iran before and after the Ayatollah seized our embassy and held Americans as hostages. The similarity between Jimmy Carter and Barack Obama does not end with naiveté and indecisiveness. It extends into their philosophy. Both men have exhibited a degree of moral equivalence that prevents them from seeing the difference between the good and the evil. I don’t consider… I wasn’t equating the Palestinian missiles with terrorism. But when the Palestinians commit terrorist acts, and I mean when a person blows himself up within a bus full of civilians, or when the target of the operation is women and children – such acts create a rejection of the Palestinians among those who care about them. It turns the world away from sympathy and support for the Palestinian people. That’s why I said that acts of terrorism like I just described are suicidal for the popularity and support for the Palestinian cause. In my book, I talk about violence from both sides, and I describe very carefully and accurately the number of casualties among Palestinians and Israelis, including children. The number of Palestinian children who died because of the violence is five times greater than the number of Israeli children, and I condemn this kind of violence on both sides. Carter was forced to apologize for what he claimed were misconstrued statements. But Alan Dershowitz has come to see two Carters – what he calls the “Brandeis Carter” who says the right things in democratic forums, and the “Al Jazeera Carter” who makes shocking statements about the state of Israel. The very title of Jimmy Carter’s book – Palestine: Peace Not Apartheid – reveals not only an incipient antisemitism, with Israel depicted as an apartheid (and therefore racist and illegitimate) state, but also a shocking degree of moral equivalence. American Thinker has an article titled, “Obama’s Moral Equivalence Problem,” that discusses this very same tendency on the part of Barack Obama. Obama not only demonstrated this in his initial patronizing statement for both Georgia and Russia to stop fighting (lumping the invaded democracy in the same category as the attacking autocracy), but he then proceeded to go even further by comparing Russia’s actions to the United States’ action in its invasion of Iraq. If that is not bad enough, Joe Biden – Obama’s pick for running mate – also has a significant history of failure to understand Iran or deal with the threat that this terrorist state presents to the United States. As Jimmy Carter speaks, and throughout this convention, we should seriously consider the Carter years, and the return to unmitigated disaster the Obama years would bring.